Meet Bonita and Manchas. 'Bonita' means 'pretty' in Spanish and 'manchas' means 'spots'. Manchas is the fish with black… yes, you guessed it. How did I end up with two goldfish with Spanish names? Well, I'd acquired them from a Chinese friend in my Japanese class. Obviously. Finding herself leaving Japan in the switch from postdoc to faculty, my friend had been unsure what to do with her fish. Taking a cat and dog on an aeroplane was one thing but…. had people even written import regulations for fish? Live ones? Despite the obvious problem (pictured in the lower pane above), I had volunteered for adoption services. Regardless of my best efforts, I had failed to lure birds to my ninth floor apartment and thought that the fish might provide something in the way of feline entertainment. How long this would last depended partially on the strength of the tank lid. My friend came over with the tank and water filter, I watched a youtube video on how to clean a fish tank and rested a book on European history on the lid. The lid promptly buckled. I swapped the book for one on American history. (a) my cat has not eaten them. (b) I narrowly avoided killing them through the temptation to dump them in a tea pot of tap water while I cleaned the tank. It's a good job I tweet my important intentions. Tallis hangs out by the tank from time to time during the day. She's never attempted to remove the lid, either because the watery contents filled her with horror or because I placed a large stuffed cow on top of the history book. She does occasionally bat the tank with one paw when she feels there isn't enough action. The fish are unmoved. Often literally. The fish themselves are surprisingly interactive. I never actually thought fish acknowledged (in a distinguishable manner) the world outside their tank. Once the glass was clean, I experimentally placed a photograph of the galaxy by one wall. It was an attempt at a Total Perspective Vortex but it apparently just confirmed was great fish they really were. Each morning when I appear, the fish come to the front of the tank and glare at me. You wouldn't think fish were capable of demanding breakfast, but apparently there is no limit to what can bully in my household. 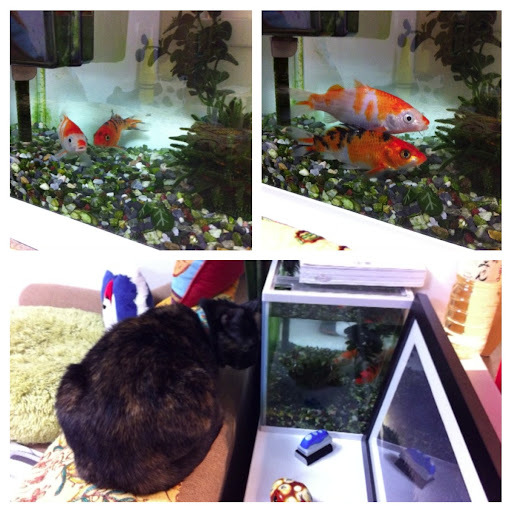 I am going to take my revenge by eating my seafood dinner on the sofa beside their tank. I don't think Tallis is below much!! I'm ... hanging on in there! I'm sure I don't need to wax lyrical to you about HOW LONG class preparation takes. It just ATE my life in one big gulp :/ All my friends told me that first year faculty is like this, but (unless the university is super mean) you teach the same course for a few years, so it gets much easier. Of course, that's not much of a consolation in June when the academic year only began in April! On the other hand, I'm starting to manage my time a bit better so some percentage of my research and that of my students gets done each week along with the lecture writing. It's hard to have two days off at the weekend, but the last few weeks I've managed to squeeze out one, which is much better! Have you started marking (test/exam) papers yet? Another big gulp. I've marked the weekly homework (although we've just switched to an online system - hooray!) but not yet had an exam. That fun is for the end of next month. At least it's only once a semester. What kind of finishes me off now is the fact you burn all out for one lecture... and then you have to do one the following week!